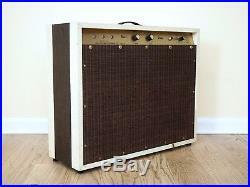 Up for sale, a 1965 Kay Bass Amp model 720 in exceptional condition and in perfect working order. A rare vintage Kay all-tube design loaded with a single 15 alnico speaker, the 720 model is as straightforward and simple as vintage tube amp tone gets. 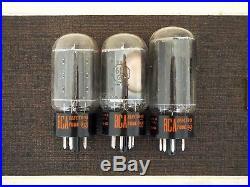 The amp has a single channel with Volume and Tone knobs, and the tube rectified circuit is loaded with the original pair of RCA 6L6GC power tubes which deliver roughly 35 all-tube watts. This is a particularly dark sounding amp even with the Tone control pegged, and as such it’s a viable option for bass tracking in a studio at low volumes for a rumbly and thick sound. With guitar, the amp has a bold roar that overdrives smoothly with churning drive. Put a treble booster or any overdrive with an EQ section in front of the amp and this Kay responds beautifully with extra top end sizzle and dynamic range. 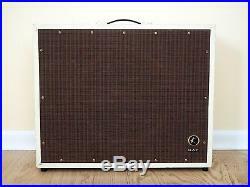 The tube compliment, cabinet size, and speaker also lend themselves to a comparison with the Supro Thunderbolt, and it’s a fair comparison, as the two amps have much in common structurally and sonically. 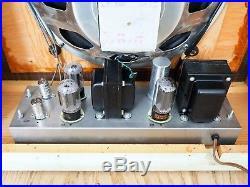 The circuit is virtually untouched with original transformers and a two-part chassis design that leaves the preamp mounted to the top of the amp and the power amp located in the bottom of the enclosure. 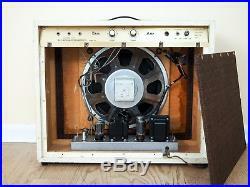 The RCA 6L6GC power tubes sound great and have plenty of life, and the amp boasts a matching RCA rectifier as well. 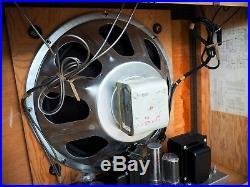 The stock Fisher 15 alnico speaker retains its original cone, with a clean frame and 1965 date stamp on the magnet bell. Cosmetically, the amp is extremely clean and the polished brass faceplate retains the original knobs as well as all of the black silkscreen text. 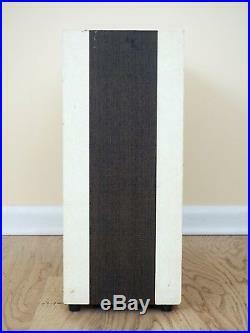 The two-tone brown and blonde enclosure shows very little wear with the original handle, rubber feet present, and raised plastic Kay badge on the grillcloth. 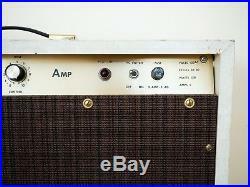 It’s as complete and well preserved example as we’ve ever seen of this model, or any vintage Kay amp for that matter! 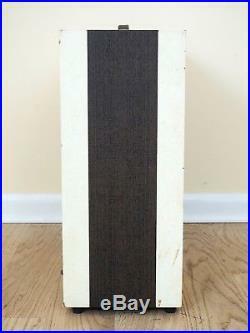 Check out our shop “Mike & Mike’s Guitar Bar, ” and please let us know if we can answer any questions! We use double thick boxes, 1″ foam, and industrial 1/2″ bubble wrap to ensure that your amp arrives safely. International orders will be declared as merchandise, and the value of merchandise will be declared as the amount paid. We cannot declare anything as a gift or for a lesser value. 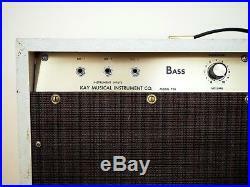 The item “1965 Kay Bass Amp Model 720 Vintage Tube Amp, USA-Made with 15 Speaker, RCA 6L6GC” is in sale since Monday, June 18, 2018. 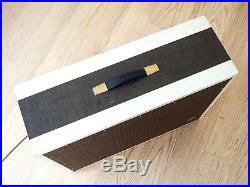 This item is in the category “Musical Instruments & Gear\Guitars & Basses\Guitar Amplifiers”. 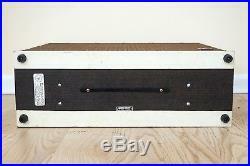 The seller is “mmguitarbar” and is located in Seattle, Washington. This item can be shipped worldwide. This entry was posted on Thursday, October 11th, 2018 at 2:45 pm	and is filed under bass. You can follow any responses to this entry through the RSS 2.0 feed. Both comments and pings are currently closed.